April 2016 - "Rapes will increase if women enter Shani Temple, women should not have entered the sanctum sanctorum of the Shani Shingnapur temple as it will bring bad luck to them. Shani is a planet of sins. Worshipping him will lead to a rise in crime against women". The comment comes just days after the temple ended a centuries-old ban on women being allowed to offer prayers at the open-air platform where the idol is placed in the Shani Shingnapur shrine in Maharashtra. Temple officials and locals in the area had prevented women from entering the inner sanctum till the Bombay High Court ruled last week that their actions were illegal. Swami Swaroopanand Saraswati has also held the worship of the "unworthy" Shirdi Sai Baba by his followers responsible for a drought-like situation in Maharashtra. Swami Swaroopanand in January 2016 noted the pitiable condition of the River Ganga and stated that the proposed dams in Uttarakhand should not be constructed to ensure the free flow of the pure water from the sources of the River. Only the free flow is required for a clean Ganga. On 30 June 2014, Swami Swaroopanand said that Article 370 should be removed from Jammu and Kashmir. He said that the abrogation of the Article will be beneficial for the people in the valley and that a demographic balance is necessary to end recurring strife in J&K. Swami Swaroopanand in May 2015 welcomed the decision of the Maharashtra government to extend the ban on cow slaughter to bulls and bullocks in the state and opined that it would increase the production of milk which will in turn help feed children in the country. Swami Swaroopanand in February 2016 questioned the claim of ISKCON to be a part of Sanatana Dharma and accused it of being a front for money-laundering, it being used to send money from India to the USA and other foreign countries. Money donated by Indians were being shunted to the USA. Swami Swaroopanand in May 2015 said, "Despite Prime Minister Narendra Modi's assertion to curb corruption, bribe taking is rampant in the country. This is because of degradation of moral values and ethics in society." Swami Swaroopanand in March 2016 said on the RSS, "RSS takes the name of the Hindus, but they have no commitment towards Hindutva. They are trying to deceive people by telling that they have come to protect the Hindus. This is more deadly. BJP rules this country now. Before this, it was Congress. But under both the governments, cow slaughter has been continuously happening. Then what is the difference between BJP and Congress? BJP initially said that they will build Ram Temple at Ayodhya and remove Article 370. Now they are saying that they will think about it." 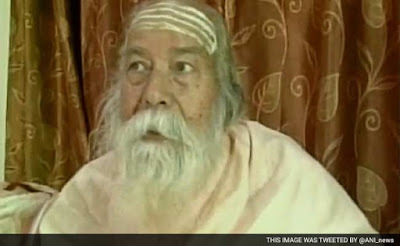 Swami Swaroopanand in January 2015 raised questions on the censor board, saying movies like ‘PK’ insult Hindu religion and Lord Shiva as well.